Step 2 To clean artichokes, first, cut off the stem/stalk. Peel off the tough outer layers by hand. When you reach the softer layers, use a serated knife to cut off about 3/4 inches from the top. Now, cut artichoke in half length-wise. Then, using a sharp pairing knife, remove all the “hairs” on the inside. Step 3 As you clean the inside of each artichoke half, immediately add 1/2 tsp lemon juice to cover the surface to prevent the artichoke from discoloring. Step 4 On a large baking sheet, place each artichoke half in a piece of lightly-oiled foil paper that is large enough to fold around. Step 5 Season artichokes with salt and pepper, and nestle 1 garlic clove in the center of each artichoke half. Drizzle generously with quality olive oil (it’s okay if some of the olive oil pools in the center or overflows onto the foil). 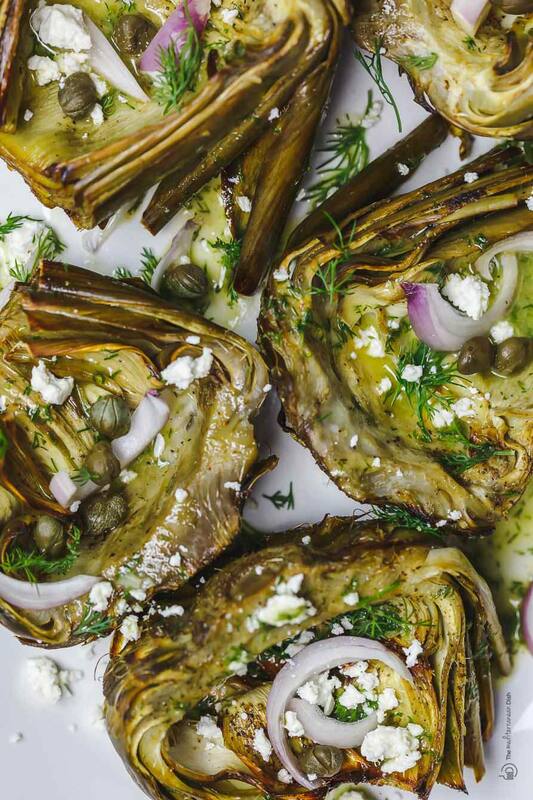 Close the foil around artichokes. Step 6 Roast in the 400 degrees F heated-oven for 40 minutes. Step 7 Carefully open the foil pouches using tongs. Remove the roasted garlic from the center of artichoke, and close the foils back until ready to serve. Let garlic cool. Step 8 In the bowl of a small food processor, add the roasted garlic with the remaining vinaigrette ingredients. Pulse until smooth. Step 9 Remove the artichokes from foil. Arrange on a serving platter, generously drizzle the roasted garlic-dill vinaigrette. Top with shallots, capers and crumbled feta cheese. Enjoy!